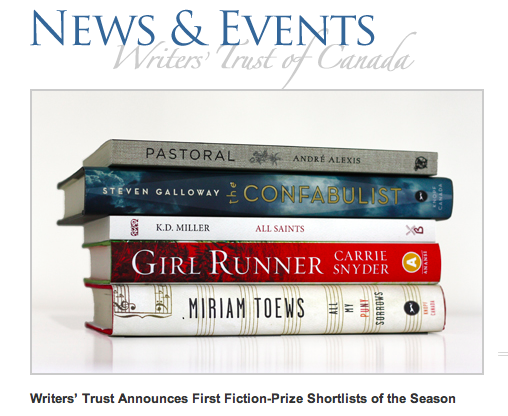 The long-shot has happened: Girl Runner is a finalist for the 2014 Rogers Writers’ Trust Award for fiction. It feels like a lightning strike, which is what I was thinking about prize lists this morning, before hearing the news. And when I heard the news, via a tweet that my cellphone casually blinked across the top of my screen, it felt like a zap, an electrical shock. I guess that’s where the phrase “feeling shocked” comes from. Somewhere real. Carrie Snyder’s Girl Runner delivers us one of the most memorable characters in decades. In 1928, Aganetha Smart won Olympic gold for Canada in track. But at 104, she is confined to a wheelchair in a nursing home, forgotten. In plumbing the depths of Aganetha’s story, Snyder has this incredible woman whisked away on one more adventure, during which she brilliantly explores the twin natures of memory and loss. Girl Runner is a witty, poignant, and finely plotted novel that offers us a character possessed of the wisdom that arises only from a life well-lived. To which I have nothing to add. I’m speechless. This could all be very bad for my ego and my super-ego and whatever other subconscious unconsciouses are floating around inside a person, but then again, maybe it’s just all good, today, right now. I’m going to go with that. Gratitude for right now. P.S. To celebrate, I’m considering splurging on a celebratory ukulele! That way I can join my girls, who’ve both taken up the ukulele recently, and have been singing and playing together in the evening (there is literally nothing more heart-warming than hearing them sing and play together, and I do mean literally) … look out for a red-haired sisterly folk duo in about a decade or so …. Congratulations! Thrilled for you and Aggie. Amazing! Incredible news. Warmest congratulations.